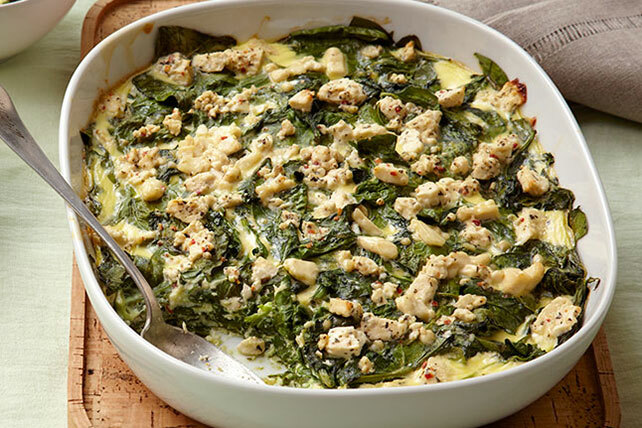 Fresh baby spinach gets a Mediterranean twist when it's baked in a casserole with an eggy mixture of cream cheese and crumbled feta with basil and tomato. Place spinach in colander in sink. Pour boiling water over spinach; cool. Meanwhile, mix cream cheese and eggs in large bowl until blended. Gradually stir in milk. Stir in 1/2 cup feta. Squeeze excess moisture from spinach. Add spinach to cream cheese mixture; mix well. Spoon onto 9-inch square baking dish; top with remaining feta. Cover. Bake 50 min. or until center is set, uncovering after 30 min. This deliciously different way to prepare spinach is the perfect side to serve at your next special occasion. Substitute 2 pkg. (10 oz. each) frozen chopped spinach, thawed and squeezed dry, for the cooled blanched fresh spinach. For added flavor and crunch, sprinkle with 1/4 cup toasted pine nuts before serving.